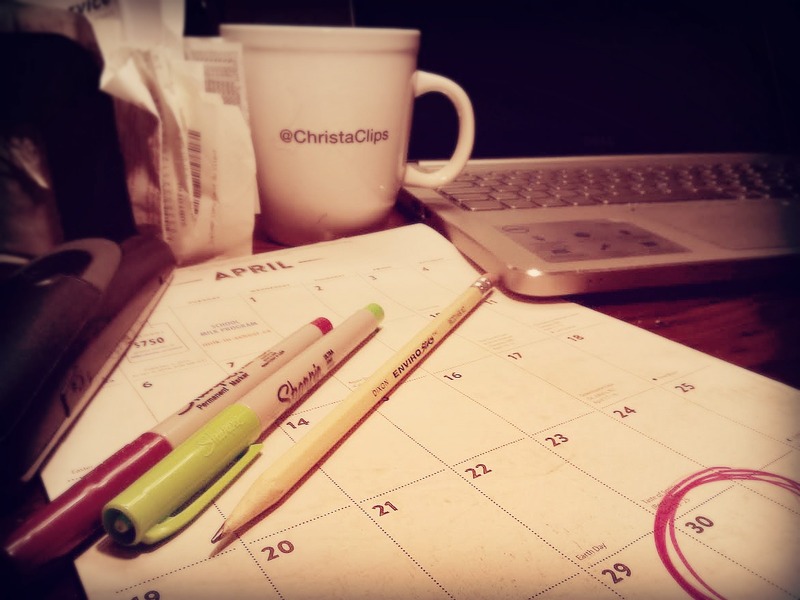 The April 30th deadline for filing our 2014 taxes is looming, and if you’re looking for a way to save time & money by preparing your tax return(s) on your own, check out TurboTax Online! And by “check it out”, I don’t mean drive to the store, compare the boxes to see which version is for you then come home to install your CD. I mean click through to TurboTax Online, let it tell you which version you need, and start doing your taxes within minutes without ever leaving the comfort of your home! TurboTax Online helps you determine which version you need with a few simple clicks and you can start preparing your tax return within minutes – no trip to the store needed! Did you know that there are FREE versions of TurboTax Online available for some income situations? If you start out on one of the FREE versions but are not eligible, TurboTax will alert you to the version you should purchase. Spread the word to family & friends who may fall into the eligible categories. Naysayers of DIY tax prep insist that it’s too much work to do one’s own taxes. I respectfully disagree. For me, the biggest amount of time & effort goes into finding and organizing my receipts for my self employment and business-use-of-home expenses: a step that I’d still have to undertake if outsourcing my tax preparation. Once my papers are in order, being guided through the process by TurboTax Online is a breeze and I suspect that it takes even less time than delivering my receipts to an accountant or tax service. And for those who push the filing deadline and run out of time to take their taxes elsewhere, TurboTax Online might just save some late filing penalties! Turbo Tax tells me what I need to go and find before I can fill in the next section. And whenever I’m not sure about what qualifies as an expense or not, there are built-in help features to … well …. help! By clicking on the HELP feature located on every screen throughout the interview process, I can type in terms and questions to the search function and choose from a number of FAQ and definitions. 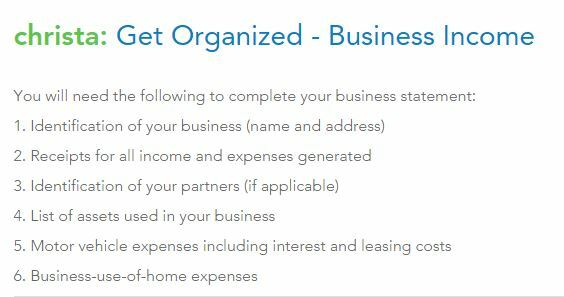 For example, I see in my checklist that I need to prepare all of my papers and receipts for my business use of home expenses. By typing into the search bar when I click on the Help button on my screen, I am given several frequently asked questions and definitions to choose from. And whenever I’m not sure if my situation applies to the definitions and explanations provided, LIVE help is just a click away. A real person. I was thrilled to find out that this feature is included FREE in my Home & Business version – I use the feature often! TurboTax Online offers the option of Pro Review and Audit Defense as well. Again, all without having to leave home! Still not sure if you’re up for doing your own taxes? You can start for FREE with TurboTax Online for all versions, even business. You can progress a fair distance before you’re prompted to purchase the version that fits your needs, so you can check it out with no commitment or expense. What have you got to lose? I certainly found time & money to gain by doing my own taxes with TurboTax Online! Want to learn more about TurboTax Online? Got tax questions? 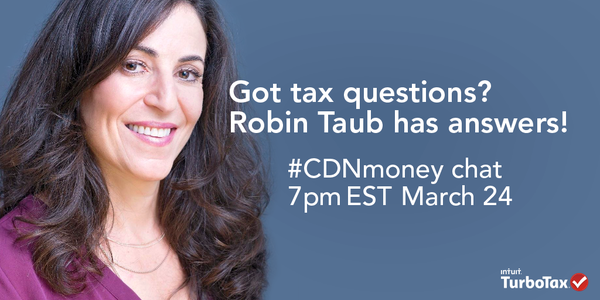 Join CommonCentsMom and I for a special #CDNmoney Twitter Chat where we’ll be joined by tax expert Robin Taub on hand to answer your tax questions. We’ll also be giving away free copies of TurboTax Online to 5 lucky #CDNmoney Twitter Chat participants! *This is a sponsored post. All opinions belong to Christa Clips and are not altered or influenced in any way. Thank you to TurboTax Canada for providing a copy of TurboTax Online Home & Business for me to test and review. As part of Financial Literacy month, @CommonCentsMom & I are diving in deeper and exploring different options for gaining more control over what we know about our money, and which resources and institutions are available to help us secure our financial futures. This week we’re exploring Credit Unions as a credible alternative to traditional banking. This video by Education Credit Union is a fun comparison of banks, credit unions and piggy banks! Join us for #CDNmoney chat on Tuesday, November 18th, 2014 with special guest @Money_On_Trees blogger Fabio of @FirstOntarioCU Credit Union as we explore cooperative banking. 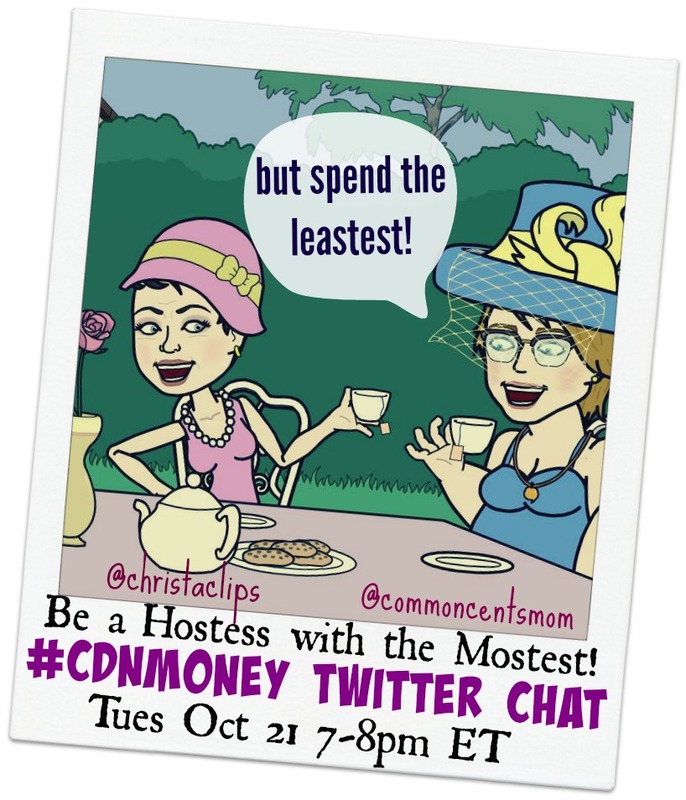 Join co-hosts @CommonCentsMom and @ChristaClips for this week’s #CDNmoney Twitter Chat on How to Be The Hostess with the Mostest While Spending the Leastest! Join the frugal minded tweeps of #CDNmoney as we share tips and tricks for saving money while hosting dinner parties over the holidays.